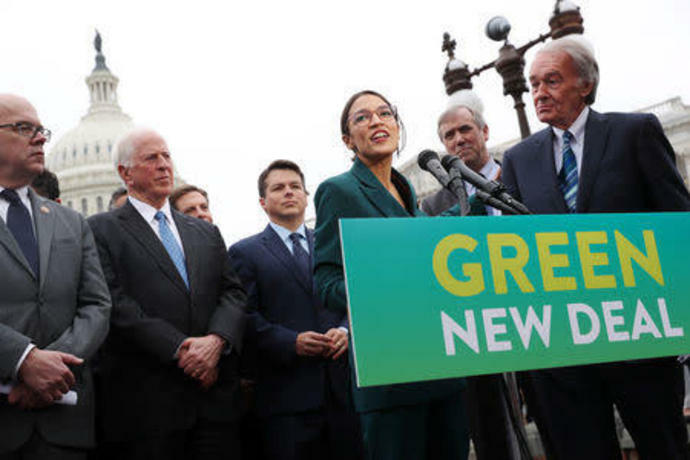 WASHINGTON (Reuters) - Labor unions say they are withholding support for a Green New Deal unveiled by Democrats last week to transition the American economy away from fossil fuels, arguing the loosely-defined plan could kill jobs if its architects aren't careful. It also calls for a "just transition" for current fossil fuel workers - from coal miners to pipeline workers - through guarantees of healthcare, jobs, and job training. "We will never settle for 'just transition' language as a solution to the job losses that will surely come from some of the policies in the resolution," said Yvette Pena O'Sullivan, executive director of the Laborers' International Union of North America (LIUNA), whose members work in construction and other industries. "We've heard words like 'just transition' before, but what does that really mean? Our members are worried about putting food on the table," he said. Members "working in the oil and gas sector can make a middle-class living, whereas renewable energy firms have been less generous," he said at a pipeline safety event last week. Democrats backing the resolution are seeking to highlight the contrast in their position with the Trump administration's vocal support for drilling and mining and its skepticism about the causes and impacts of global warming. Trump's approach was warmly received in 2016 in parts of Appalachia and the Rust Belt, which have been suffering from manufacturing and mining jobs losses. Trump's Democratic challenger Hillary Clinton struggled to sell her clean energy agenda in those regions, and suffered politically after saying her policies would "put a lot of coal miners and coal companies out of business." "A lot of places struggling with joblessness are fossil fuel dependent places that suffer from poor air and water quality. Guaranteeing the right of clean air, water and jobs is something we think a lot of people can get behind," said Stephen O'Hanlon, a spokesman for the group.